For the majority of its shooting schedule, the crew of Sudhanshu Saria's Loev assumed they were working on a friendship film like Dil Chahta Hai. What else would a director be shooting with three guys, right? That changed after Sudhanshu asked Shiv Pandit to kiss his co-actor, Dhruv Ganesh, in the middle of an outdoor shoot. It's understandable why Sudhanshu would use such a secretive approach towards filming. You can't be gay in India, let alone shoot a 'gay love story.' We brought up the term during our conversation with the team of Loev during the recently-concluded Jio MAMI Mumbai Film Festival, and Sudhanshu was quick to clarify, "It's a love story, not just a gay love story. That's the one thing I was sure about from the scripting stage to shooting and even now. We didn't want to attract the wrong kind of attention to the film, especially during the shooting phase. So, only a select few people knew the story and details about the movie. For everyone else, it was something like Dil Chahta Hai." The kissing scene was a surprise, both for the crew and the cast. Shiv, who plays Jai, a hot-shot NRI banker, in the film, knew it was in the script, but was caught by surprise when Sudhanshu asked him to kiss Dhruv, who plays Sahil, right after a tiring trekking sequence. He told Vagabomb, "We did one shot where we were talking, and I was supposed to look at Dhruv with these intense eyes. We cut, and then Sudhanshu told me separately, 'Good shot, but in the next one, I want you to kiss him.' I was like, 'What? Here?' And he said yes. So, I went back and I kissed him. You could feel the tension in the air after that. Everyone in the crew shifted uncomfortably and had a moment." That's not the only unusual thing about this film's shooting process. Siddharth Menon, who plays Alex, told us about the many hours the trio spent in workshops. 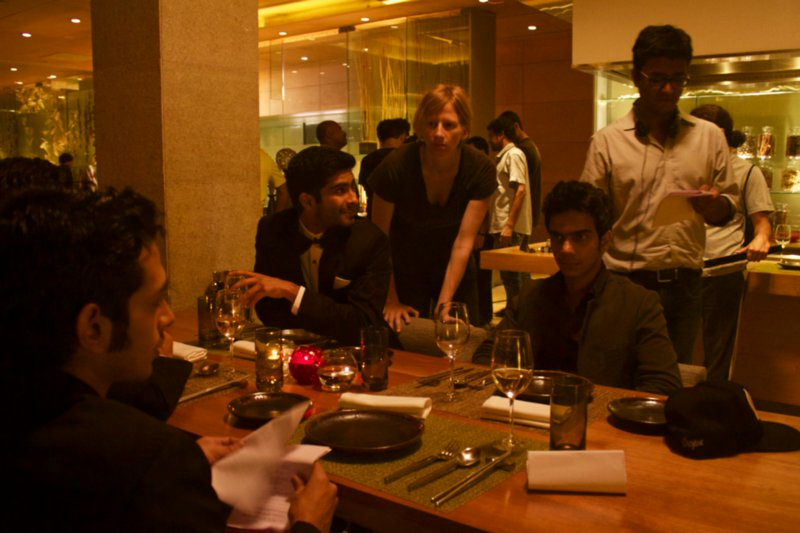 "Dhruv and I actually went on dates as part of the workshop. We would spend time together as a couple, we came up with the backstories of our characters, and we often came up with our own lines. Sudhanshu helped us understand our characters, but we took them forward on our own." And this chemistry, between Jai and Sahil, and Sahil and Alex, is evident in the film. In fact, their chemistry is what stood out right from the first trailer. Sudhanshu explained how he made that happen. "Loev is a story of three men who are at different places in their life and are dealing with the complexity of love in their own ways. Their sexual orientation is not the highlight of the story. There is no coming out scene with the family and no cliched description of what gay men look like. We treated this like any other love story, which is complicated and beautiful and ugly at the same time." Loev made its India debut at the MAMI Mumbai film festival, and was well-received at all its screenings. But for the entire team, Loev is first and foremost a film, and not a social campaign. Sudhanshu told us, "While writing or shooting the film, I didn't think of it as a bigger campaign against the society or the government. Which is why I wasn't prepared for the response our trailer got or what the film is getting now. It was important for me to write believable characters with believable problems. I don't expect this film to change lives. But I'm glad that members of the Indian LGBT community have appreciated the story and can relate to these three guys and their story." Shiv and Siddharth added, "We've been flooded with messages on social media about how the film has helped people come out to their loved ones, how they're glad to be represented accurately for once. We didn't expect any of that, but it is obviously heartwarming." On a lighter note, Shiv added, "The number of friend requests I get from guys has gone up considerably, too." The film has already got the stamp of approval from many prestigious international film festivals, and Sudhanshu is hoping to take it around the country, too. "The good thing is that our audiences are evolving. Both the members of the LGBT community and its supporters are sick and tired of how Bollywood chooses to represent them. This is why Loev stands out, because we're not making caricatures out of anyone. You would know these guys, be friends with them, and deal with the same kind of heartache like them." And that explains the title of the film. Love is love, however it may be spelled.